SONSONATE, El Salvador (CNS) — In 1977, when Franciscan Father Flavian Mucci found himself away from home, he decided to host Christmas dinner for the homeless in a rural zone of El Salvador. It was a meal the young friar would never forget. In helping the poor, the Boston native, then in his 30s, said he found a happiness that he hadn’t before experienced. He turned that experience and expanded it into what is now the Agape Association of El Salvador, a nonprofit with a $13 million annual budget and, with more than 700 permanent staffers, one of the biggest employers in the country. Known simply as Agape, the Greek word for unconditional love, the organization runs homes for the elderly, a nascent university for low-income students, clinics, mobile medical services, a restaurant, a hotel, training centers, a TV station and a radio station, among its most notable programs. 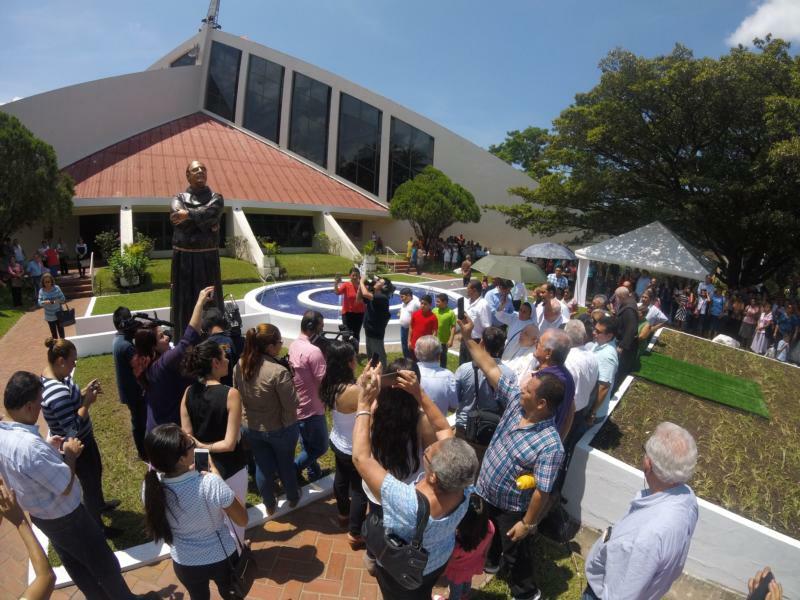 The Franciscan-founded association has earned multiple international as well as national awards from the Salvadoran Association of Industrialists for its entrepreneurship. Franciscan Father Jack Hoak, named general director in 2012, said though Agape operates on a business model, the Franciscan spirit and St. Francis’ ideals of humanizing the poor and creation, flow throughout Agape in its training, in the way employees are encouraged to treat one another as well as those they serve. Staffers attend Franciscan-style retreats and are encouraged to explore the charism of the Franciscans, particularly as it pertains to the poor. “We want the poor to have opportunities and that was the intention of the founder,” said Father Hoak in an interview with Catholic News Service. In a country racked with everything from war, natural disasters including earthquakes and hurricanes, and government corruption, Agape has remained a stabilizing presence. Though Father Mucci said that when he arrived, health care and education were priorities, Agape has expanded its mission to include the world of communications, which is why it also runs radio and television stations. In the middle of the mayhem that has long plagued the country, the “word of God has gotten lost,” said Father Mucci in an April interview with CNS. In a country that was once predominantly Catholic, some now don’t believe in God, he said. Agape TV and Radio Luz, both of which also have a strong social media presence, provide news as well as religious programming, including Masses via television, as well as interviews with notable Catholics in the country discussing developments in the church or highlighting the good works of the church in El Salvador and the region. In recent years, Father Hoak, a former military chaplain who served in Iraq and also spent time in Bosnia, has taken over for Father Mucci on the TV and radio station as well as in the daily operations of Agape, though Father Mucci still is a presence. The organization also has expanded job training and education, offering vocational training centers throughout the country for those who want to learn and be certified in cooking, information technology, auto mechanic, and other trades. The education centers aim to develop the young students’ technical abilities but also other life skills that empower them, said Patricia Lazo, Agape’s coordinator of quality control. “We want the youth to become entrepreneurs, not just employees,” said Lazo. Agape might be run like a business, but it will never lose its Franciscan spirit, said Father Hoak.